As the role of data becomes more prominent in the health care space, education and workplace shifts must occur within HIM to keep pace. The HIM profession is in transition. An aging population with more complex medical needs coupled with the health care system's evolution to quality-based, data-driven care and reimbursement models is driving the change. In addition to a growing demand for HIM professionals, emerging care models and the shifting regulatory landscape are calling for a vastly different set of skills and education than were needed less than a decade ago. 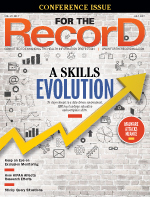 "As we move more and more from paper to technology, not only are there many jobs available in this space, but employers tell us that the competition for qualified HIM professionals is growing exponentially, creating even greater demand," says Jaysa Boyer-Tushaus, national director of corporate alliance for Ultimate Medical Academy. The US Bureau of Labor Statistics projects a 15% growth rate in HIM employment by 2024, which is more than double the average growth rate for all occupations. That's approximately 29,000 new positions expected to be created within a decade. But high demand isn't resulting in an HIM shortage—not yet, anyway. The biggest challenge confronting the profession isn't filling openings but rather closing a talent gap created by shifting roles, responsibilities, and expectations in a data-centric field. "The gap [relates] more to whether the individuals coming out of [academic] programs are prepared for the job in the sense that they are ready to handle what's going on in the industry now," says Elizabeth Delahoussaye, RHIA, CHPS, senior vice president of compliance and privacy with Ciox Health. "A lot of the [HIM] industry is data driven. … For us to be more relevant in our industry of HIM services, we have to be concerned about data." Delahoussaye points to privacy and security as being challenged by the limited availability of data management-savvy HIM professionals. Whether the next generation will be ready to succeed in a data-intensive environment—where they will be called upon to be proactive when it comes to reversing the recent uptick in unauthorized data exposures—remains to be seen. The current HIM workforce needs help to get in front of security issues so "they aren't blowing up in our faces," Delahoussaye says. "You really do have to be a numbers person, and I don't know if the outgoing group [of new graduates] is ready for that [or] for how they need to apply information to their current environment. Those already in the trenches see it. They're being asked by their C-suites for the information, or being asked to think outside the box, which is very much data driven." Merida Johns, PhD, RHIA, founder and director of The Monarch Center for Women's Leadership Development, founding director of the graduate program in health informatics at the University of Alabama-Birmingham, and current professor and director of health informatics and information management at Resurrection University, isn't convinced that a gap exists between talent and the "pressing needs of the health care industry with regard to managing data as a corporate asset." She points to a graduating class that is "ahead of the industry curve in understanding and knowing how to manage protected health information in both paper-based and digital worlds" and practicing professionals who "have been at the vanguard in master data management, data quality management, consumer engagement, data mapping, and interoperability for years, sometimes decades, and have understood that managing data on an enterprisewide level is critical." • Between current information management strategy set by executive management and the strategy needed to address "the data deluge that has overcome the industry." • Between a narrow interpretation of HIM professional roles and the actual depth and breadth of HIM expertise, which leads to roles being seen as limited to billing, coding, revenue cycle, and release of information functions vs expertise in data and information management. • In the progression of women into senior and executive level careers "where they can have influence in policy making and setting strategic agendas for the management of health care data and information as a strategic asset," Johns says. "Part of this gap is due to implicit bias concerning women's expertise and competencies, and this bias flows over to a perception gap in HIM roles and abilities." • Between the number of graduate programs accredited by the Commission on Accreditation for Health Informatics and Information Management Education and the number of programs needed to satisfy industry needs. "With only five accredited graduate programs in HIM, the output hardly meets the need for graduate-level professionals who are prepared to take on senior and executive roles in crafting health care data and information policy enterprisewide or to lead high-level organizational strategy for management of data and information as a corporate asset." Driving the "extreme gap" in education is a failure to clearly delineate the distinction between health informatics and information management, Johns says, adding that HIM's significant contributions are getting lost in both the education space and the general industry marketplace. There are also no doctoral programs in HIM, which "further limits the development of health information science or the research on the integration and implementation of associated sciences to the discipline of health information management," she says. Johns notes that maintaining HIM as a discipline "equal to any in the allied health space, the profession must take aggressive action in promoting and supporting graduate-level education in HIM and differentiate itself from health informatics and health information technology." • an ability to work with stakeholders. "In addition, professionals are developing an ability to market and manage information governance, perform data analytics and business intelligence, and direct and manage diverse projects. Of course, current professionals serve as privacy officers, a need expected to continue," Murphy says. It's not just the curriculum configuration that is evolving. The approach to education is also transforming to accommodate a diverse student body. According to Tasha Green, MS, RHIA, CHT-TR, director of HIM programs at Prince George's Community College, changes to the profession and student needs have led to a reengineering and restructuring of education models to emphasize simulated and adaptive learning. This approach, she says, allows students to see how their skills will be utilized and incorporated into programs outside of HIM, such as allied health and radiology. It's important to expose HIM students to other courses because "they will be collecting data and information from all areas of health care and they will be tasked to educate other health care providers on how to utilize and incorporate data into quality improvement initiatives," Green says. HIM education programs also seek to capture the interest of students at a much younger age, ideally right out of middle school. Prince George's is set to launch a program in the fall that allows students to take HIM courses as they move from middle to high school. "They already know how to use the technology and the information," Green says. These initiatives have created a hybrid environment where the student body includes adults who are seeking to enhance their careers, individuals who have worked in other countries, and high school and middle school graduates. Everyone "brings a different element to learning. It's not a traditional program. … I have twentysomethings and fortysomethings who learn from each other," Green says. "It's a really diverse group of students from all cultures and backgrounds." That diversity is forcing educators to identify how they can be more innovative in the classroom—especially how to incorporate more technology such as simulated learning as well as adaptive learning, Green says. It's not just the classroom that is experiencing a new level of diversity. According to Delahoussaye, one of the biggest challenges for HIM employers and managers is finding ways to achieve harmony among three very different generational groups: retiring baby boomers, Generation X managers, and entry-level millennials. "You've got new professionals coming out of school and established HIM professionals who are somewhat thinking outside the box. The question becomes, to me, how do we get these two groups to talk to each other? They have two different ways of communicating and differing expectations from the workforce," she says. "The established professionals are bricks and mortar, while the millennials want to work from home and have a flexible schedule. They [millennials] communicate by text and try their best not to pick up the phone to make a call." Neither group is right or wrong. Generation X brings stability, institutional knowledge, and the ability to mediate between the baby boomers and millennials, while the next generation of HIM professionals pushes the innovation envelope and doesn't shy away from sharing their ideas. "We need to look at where millennials will drive us because it's going to happen in the next five to seven years. We'll see the old guard retire and the millennials become more prominent, not just in HIM but in the health care profession in general," Delahoussaye says. "When they take the driver's seat, it's going to be exciting because they have such a different way of communicating what their expectations are, and that's not all bad." The key, she continues, is to create an environment in which all three generations are comfortable. That could mean deploying platforms and policies that enable traditional forms of communication such as phone calls and e-mails and also accommodate the text, video, and instant messaging preferred by the incoming class of HIM professionals. To that end, Boyer-Tushaus advocates leveraging tenured staff as subject matter experts, utilizing them to "train and produce the HIM leaders of tomorrow. This will not only provide the learning opportunity that we've been told new HIM professionals seek, but also can potentially help retain seasoned employees by giving them an opportunity to mentor these individuals," she says. Boyer-Tushaus notes that today's entry-level HIM professionals aren't looking for a 40-year commitment from their employer. Rather, they desire companies that will provide a path for career advancement through benefits such as education opportunities and a more flexible structure. "There is a new breed of HIM professional on the horizon," Boyer-Tushaus says. "They enjoy a challenge and are willing to step into a project because they are happier when they can try new things or continue to learn new skills at work that build on what they have learned at school. They are motivated by recognition and will put in the effort for the instant gratification of a job well done." The evolution of HIM has not only transformed professionals, education models, and the workplace; it has also forced employers to shake up their recruitment practices. "The future of successful hiring in the HIM field is going to rely on a multifaceted talent strategy," says Jaysa Boyer-Tushaus, national director of corporate alliance for Ultimate Medical Academy. "Employers are going to have to diversify their portfolio of candidates by keeping a talent pipeline of experienced employees at the same time they are growing their team with entry-level employees." To fill that pipeline, employers need to throw away cookie-cutter job descriptions and instead craft something that is "intriguing to the current population of candidates," she says. "If they also look at the aptitude and previous success of candidates instead of just relying on direct experience in the field, they will have the opportunity to hire an employee with the right culture fit. This will not only improve employee relations but also positively impact employee retention." Employers should also consider partnering with a school that has a programmatic focus, producing industry-ready graduates who are enthusiastic about starting their HIM careers. These institutions will often invite employers to participate in advisory boards to influence curriculum changes and additions as a way to gain crucial market feedback. "By partnering with a school, employers will get candidates that have been trained not only in valuable health care skills but also coached in soft skills that are vital to employee success," Boyer-Tushaus says. Hiring managers should review résumés in a new light and consider candidates who have built their skills through several shorter engagements. The benefits of doing so can be seen in a recent experiment undertaken by Ultimate Medical Academy designed to test the idea of employee effectiveness by examining their productivity at several stages of their careers. "We were surprised to find out that newer employees were performing at a higher level of customer service and were often faster in completing tasks," Boyer-Tushaus says, adding that some newer employees were also more likely to stay on the job for more than a year. "For the most part, this is because new employees are trying to make a name for themselves and they feel loyal to the company that gave them an opportunity to step into the field they are really interested in working in. Perhaps they feel like they owe it to the company that gave them an opportunity to soak up as much knowledge as possible and truly want to impress them by performing at their best." When it comes to landing that dream job, "Candidates with demonstrated success in leadership and change management, project management, experience in working with IT and operations teams, and technical skills and knowledge of data analytics present strong profiles to potential employers," says Gretchen Murphy, MEd, RHIA, FAHIMA, who recently retired as director and senior lecturer with the Master of Health Informatics and Health Information Management program in the School of Public Health at the University of Washington. To showcase those attributes, candidates must pay meticulous attention to detail, from the initial application to the interview and after. Résumés should be tailored to the job announcement, Murphy says, noting that advice and sample résumés are available at most university career centers. To prepare for an interview, Murphy recommends candidates take advantage of webinars and other resources. "Research the organization and be prepared to explain how your skills and contributions will be an asset," she says, adding that "professional portfolios sell. We encourage students to prepare one that features and illustrates their accomplishments, including samples of their work products. There are online resources on developing electronic portfolios as well." Candidates should market their skills to prospective employers by communicating the benefits they bring to the table, says Elizabeth Delahoussaye, RHIA, CHPS, senior vice president of compliance and privacy with Ciox Health. For example, it's always a good idea to spotlight any change initiative undertaken at a previous job—even one unrelated to HIM. Don't be afraid—up to a point—to express yourself, Delahoussaye says. "Tell us if you can see areas for improvement in our own organization. Don't tell us everything that is wrong, but tell us how we can stand out," she recommends. "What will you do to help refresh the organization? That's one of the biggest things I look for now, [along with] what you see that would entice other millennials to our organization." Jaysa Boyer-Tushaus, national director of corporate alliance for Ultimate Medical Academy, says candidates can distinguish themselves from the competition by highlighting their talent in creative ways. For example, candidates should not focus solely on their skill sets, "but rather share the passion they have for the HIM field and the goals they hope to reach. Share previous successes they have had and explain to employers how they can translate to the positive results they will see in the future. "Don't be afraid to sell transferable skills and be confident that employers are really looking for candidates that are going to bring a positive impact to their organization through a combination of attitude and skill," she adds. "The talent gap is actually giving opportunities to the health care field that have not always been there in the past. New HIM professionals should take advantage of this to get their feet in the door."